Medical Research Council Group in Molecular Biology of Membranes and the Department of Biochemistry, University of Alberta, Edmonton, Alberta, Canada. The components within cytotoxic lymphocyte granules are responsible for a significant fraction of T and NK cell-mediated death. Perforin is stored in these granules together with calreticulin. Calreticulin has long been recognized as a chaperone protein of the endoplasmic reticulum (ER) and is the only resident ER protein to be found in the cytotoxic granules. Here we implicate a role for calreticulin in killing and report that it controls osmotic lysis mediated by purified perforin. Calreticulin, at a concentration of 2.2 × 10−7 M, completely blocked perforin-mediated lysis. Inhibition was stable and held over 5 h. Recombinant calreticulin, at a concentration of 8.8 × 10−7 M, also blocked lysis, indicating the inhibition was due to calreticulin and not a copurifying protein in the native calreticulin preparations. Using calreticulin domain fragments (expressed as GST fusion proteins), we found inhibitory activity in the high-capacity calcium-binding C-domain, which does not bind perforin. The N- or P-domains, which can bind perforin, were unable to block lysis. The inhibition of lysis was independent of granzyme inactivation or the ability of calreticulin to sequester calcium. Our data indicate that calreticulin regulation of perforin-mediated lysis probably occurs without direct interaction with perforin. We propose a novel model in which calreticulin stabilizes membranes to prevent polyperforin pore formation. Cytotoxic T lymphocytes and NK cells kill tumor and virally infected “target” cells. These killer lymphocytes use two killing mechanisms: Fas-Fas ligand triggered apoptosis and granule exocytosis (1, 2). The lytic granules contain perforin, serine-dependent proteases, called granzymes (reviewed in Ref. 3), and calreticulin (4, 5). Granule-initiated cell death occurs via both necrosis and apoptosis (6). We are studying perforin-dependent necrosis by evaluating the osmotic lysis of erythrocytes. 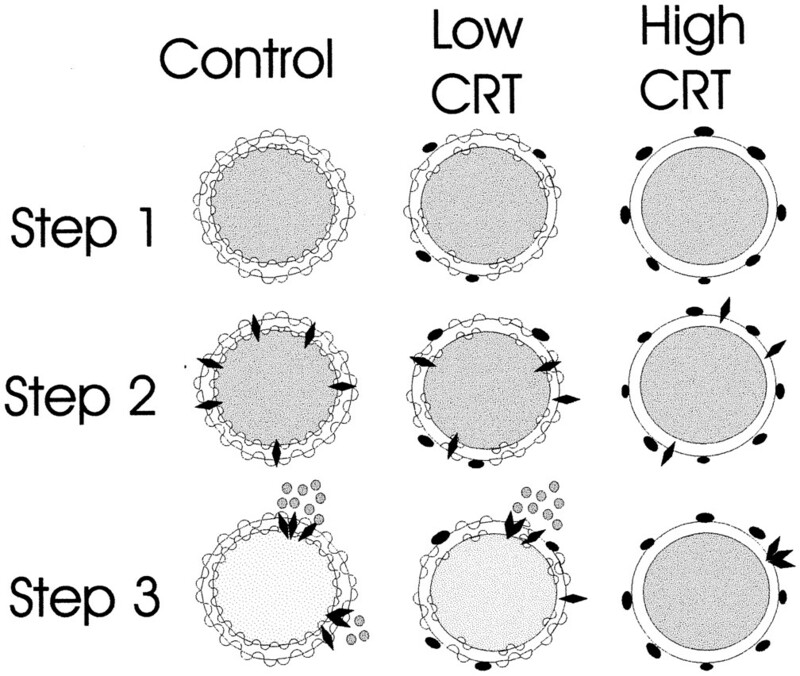 Perforin is required for granule-mediated cytotoxicity. Perforin gene-ablated (“knockout”) mouse cells are unable to kill using the granule exocytic pathway (7, 8, 9). Perforin forms pores in the target cell plasma membrane, initiating direct osmotic lysis and/or facilitating the entry of granzymes into the target cell (10, 11). Inhibition of granzyme proteolytic activity blocks perforin-dependent pore formation in both hemolytic assays and NK cell-mediated assays (12). Granzymes also initiate the procaspase apoptotic cascade leading to a second type of granule-initiated target cell death, apoptosis (13, 14). After granule-mediated necrosis or apoptosis, the killer cell is unharmed, suggesting that a protective mechanism remains to be discovered. What is calreticulin and why is it in cytotoxic granules? Calreticulin is a calcium-binding resident protein of the endoplasmic reticulum (ER),3 belonging to the KDEL protein family (15). Calreticulin is the only KDEL protein found in cytotoxic lymphocyte granules, which suggests that it has a novel function in granule-mediated cell death (5). In the lumen of the ER, calreticulin functions as a protein chaperone. It has three distinct domains: the amino terminal N-domain, the proline-rich P-domain, and the carboxyl-terminal C-domain (16, 17, 18). The N-domain binds to the protein sequence KxFF[K/R]R, which is found in the cytoplasmic domain of the α-subunit of integrins (19) and in several steroid hormone receptors, including the glucocorticoid receptor (20), the androgen receptor, and the retinoic acid receptor (21). Perforin contains the amino acid sequence KVFF (residues 439–442), which represents part of this calreticulin-binding motif. Interaction between perforin and calreticulin occurs through this N-domain. Calreticulin binds perforin with affinities great enough to support coprecipitation. However, precipitable complexes fail to form in the presence of calcium (5). The P-domain of calreticulin (see Fig. 4⇓A) binds specifically to oligosaccharide-processing intermediates N-linked to proteins (22). Perforin has sites for N-glycosylation, a process dependent on calcium. Calreticulin may chaperone N-glycosylated perforin; however, calreticulin appears in the granules of lymphocytes from perforin “knockout” mice (5). Calreticulin binds calcium with both high affinity (Kd ∼1 μM)/low capacity (1 mol of calcium/mol of protein), localized in the P-domain, and low affinity (Kd ∼1 mM)/high capacity (25 mol of calcium/mol of protein), localized in the C-domain (17). The C-domain is thought to provide one of several reservoirs for intracellular calcium. In this report, we have evaluated the three domains for their effects on lysis. Here we report that calreticulin inhibits perforin-mediated lysis. The calreticulin inhibition occurs at physiologically relevant concentrations, is dose dependent, lasts over time, and is attributable to the C-domain. Our results suggest that calreticulin may play a previously unrecognized and biologically relevant role in lymphocyte-mediated cytolysis. Cytotoxic granules (23, 24) were obtained from RNK-16 cells, a NK cell-like leukemia (25) that was grown as ascites cells in F344 rats obtained from the National Cancer Institute (Frederick, MD). The ascites cells were washed with Borregaard’s relaxation buffer (26) and then ruptured using a nitrogen cavitation bomb (Parr Instrument, Moline, IL) pressurized to 450 psi. The lysate was layered over 54% Percoll (Sigma, St. Louis, MO), which formed a gradient during a 20-min centrifugation at 45,000 × g at 4°C in a Beckman Ti50.2 rotor (Fullerton, CA). The dense fractions (up to 1.068 g/cm3) were pooled. Nuclei were removed by filtration through a 3-μm Nucleopore filter (Millipore, Bedford, MA) (23). The Percoll was then pelleted by a high-speed spin for 4 h at 145,000 × g. Granules were collected from above the Percoll pellet. Dry NaCl was added to increase the salt concentration by an additional 1 M. The granule membranes were disrupted by three freeze-thaw cycles (24). The granule extracts were stored at −20°C. Protein concentrations were determined by a bicinchoninic acid assay (27) (Pierce, Rockford, IL) using BSA for calibration. Perforin was prepared by immobilized copper metal affinity chromatography (IMAC) (24) followed by hydrophobic interaction chromatography (HIC) (13). Columns were attached to a Pharmacia (Piscataway, NJ) fast protein liquid chromatography work station. Before the IMAC column, EGTA was removed from the granule extract by Bio-Gel P6-DG chromatography (Bio-Rad Laboratories, Richmond, CA) (1.6 × 20 cm), which also exchanged the granule proteins into IMAC loading buffer of 20 mM HEPES (Fisher Scientific, Fair Lawn, NJ), 10% betaine (B-2629, Sigma), 0.1% NaN3 (Fisher), and 1 M NaCl, pH 6.1. These granule proteins were then loaded onto an IMAC (Poros MC/P 5 × 50 mm; PerSeptive Biosystems, Cambridge, MA) column that was precharged with copper and eluted with a gradient of 0–0.2 M imidazole (Sigma). The IMAC running buffers lacked betaine. Perforin eluted at ∼0.06 M imidazole. After the addition of dry NaCl to make the perforin sample 2 M NaCl, the sample was loaded onto a phenyl-Superose HIC column (HR 5/5; Pharmacia). The loaded column was washed with starting HIC buffer containing 2 M NaCl, 10% betaine, 20 mM Tris (Fisher), 1 mM EGTA (Sigma), and 0.1% NaN3, pH 7.2. The bound proteins were eluted with a NaCl gradient decreasing to 0 M NaCl using NaCl-free HIC buffer. Perforin eluted in several fractions at ∼1 M NaCl. The fractions with high lytic activity were pooled before daily use. Perforin was detected with erythrocyte cytotoxicity assays. Protein was measured by bicinchoninic acid assays. Cytotoxic activity was determined from the hemoglobin released from lysed erythrocytes (24, 28). Dilutions of isolated perforin were incubated with 0.5% (v/v) RBC at room temperature in 0.2 ml in round-bottom microtiter plates (Becton Dickinson Labware, Lincoln Park, NJ). The assays were incubated for 20 min at room temperature unless otherwise stated. The assay buffer contained 10 mM HEPES, 0.15 M NaCl, and 10 μg/ml BSA (A4503; Sigma), pH 7.5, with the addition of calcium (to 1 mM during incubation) to initiate lysis (28). The reaction was halted by acidification to pH 6.0 with 2[N-morpholine]ethane-sulfonic acid (M-8250; Sigma) (28). The microtiter plates were spun at 1500 × g for 10 min. The cell-free supernatants were transferred to a second microtiter plate. The released hemoglobin was detected at 412 nm with a Molecular Devices (Palo Alto, CA) microplate reader. The percent lysis was calculated as follows: [(experimental hemolysis − spontaneous hemolysis)/(maximal hemolysis − spontaneous hemolysis)] × 100. Saponin (Sigma), 0.015% final concentration, was added to produce maximal erythrocyte lysis. 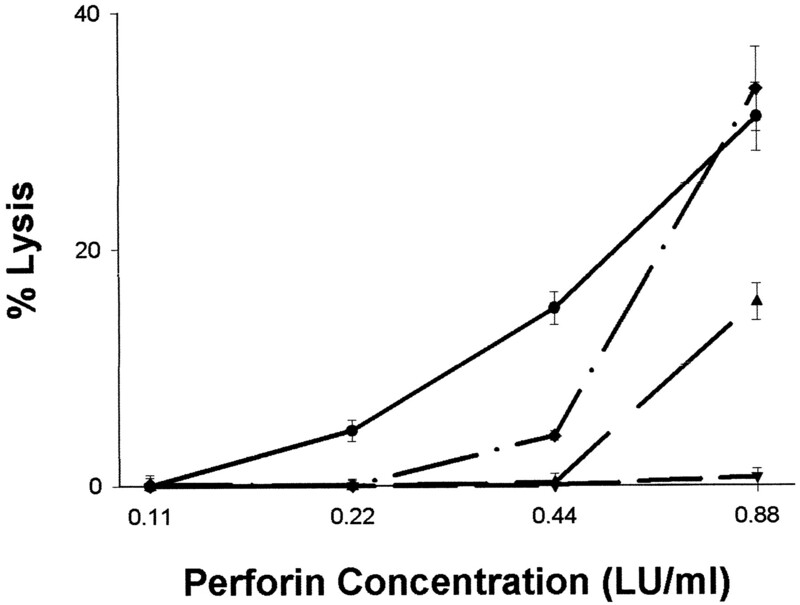 The activity of perforin was expressed as lytic units per ml. One lytic unit is the amount of perforin needed to mediate 50% lysis of the RBC. The units of activity were calculated by linear regression of the perforin activity at several dilutions. The lines had r values of >0.95. Calreticulin’s effect on perforin hemolysis was determined by mixing perforin and calreticulin together in HEPES-buffered saline without exogenous calcium (to simulate intragranule low calcium conditions) and then adding erythrocytes, suspended in buffer with calcium, to initiate hemolysis. Calreticulin or control HEPES-buffed saline with BSA was added to stock perforin solutions before perforin dilution. Each perforin sample was diluted with salt-free HEPES buffer, pH 7.5, to 0.15 M physiological salt concentrations for lytic assays. 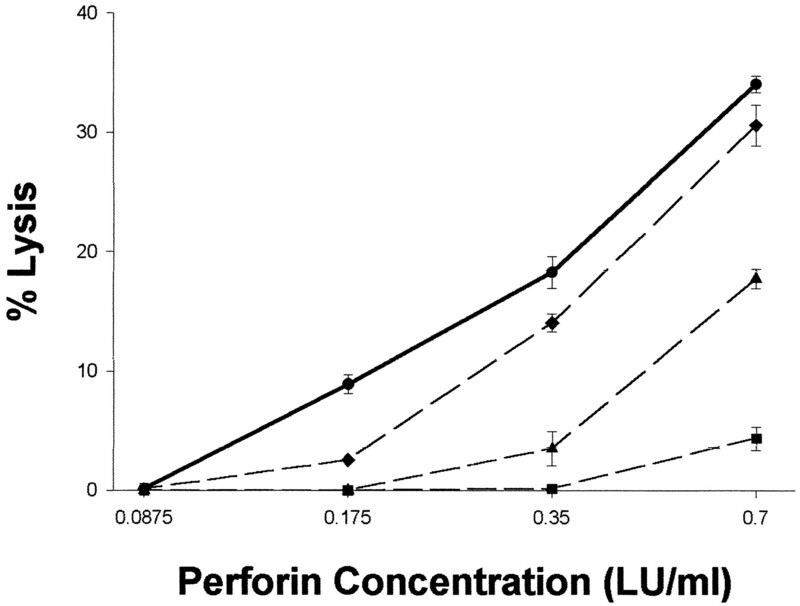 The perforin/calreticulin solution was diluted further with 0.15 M NaCl, 10 mM HEPES buffer, and 10 μg/ml BSA (Sigma), pH 7.5, containing calreticulin to maintain the calreticulin concentration during further dilutions of perforin for dose titrations. (Controls were diluted without calreticulin.) After dilution, aliquots of 0.1 ml were placed in 96-well round-bottomed microtiter plates followed by 0.1 ml of erythrocytes suspended in buffer with calcium to initiate lysis. The lytic assays, see above, were then conducted, stopping the assays by acidification at the times indicated. Enzyme activities were measured using colorimetric assays with peptide thiobenzyl ester substrates (12). After cleavage, these substrates release the thiobenzyl group, which is detected using Ellman’s reagent (29), dithiobis- -(2-nitrobenzoic acid). The product absorbs at 412 nm. A Thermomax microplate reader (Molecular Devices, Palo Alto, CA) in the kinetics mode was used to measure the rates of substrate hydrolysis (30). Canine pancreatic calreticulin and cardiac calsequestrin were purified by the ammonium sulfate procedure (31, 32). GST fusion proteins, with either the N-terminal calreticulin domain (N-domain) of amino acid residues 1–182 (fusion protein Mr ∼44 kDa), the proline-rich calreticulin domain (P-domain) of amino acid residues 182–290 (Mr ∼37 kDa), or the C-terminal calrecticulin domain (C-domain) of amino acid residues 330–401 (Mr ∼33 kDa), were expressed in Escherichia coli and purified as described by Baksh and Michalak (17). Full-length recombinant calreticulin without its signal sequence was expressed in Pichia pastoris strain KM71 using the plasmid pPIC-9, as described by Invitrogen (San Diego, CA), and then purified by DEAE-Sepharose and by Resource Q fast protein liquid chromatography (Pharmacia). The purity was monitored by SDS-PAGE chromatography, and the protein identity confirmed by Western blots (M. Michalak et al., manuscript in preparation). Table I⇓ summarizes the results of many experiments to determine the sensitivity of perforin to inhibition by calreticulin. We evaluated the effects after each of several steps of perforin purification. The table also presents data obtained from one step-wise purification of perforin indicating typical lytic activity, granule serine-dependent protease activity, and protein quantification. Inhibition by native calreticulin was highly consistent with 75-fold or better enriched perforin (eight of eight experiments). There was variable inhibition with unfractionated granule extracts (three of five experiments). Inhibition was scored when control lysis was 30% or greater and the lysis inhibited by 6.8 × 10−8 M native calreticulin (or higher concentrations) was less than half (>15 percentage points below) control. We estimate that calreticulin must be at least 15 μg/ml (>4 × 10−7 M) at the time of exocytosis for RNK-16 granules. This estimate was based on quantification of calreticulin by Western blots in which aliquots of RNK-16 granule extracts were compared vs a standard titration of pure calreticulin (figure 2⇓ in Ref. 5) with adjustment for the dilution of the extracts with the assumption that the increase in specific gravity of granules over the specific gravity of water was due to the granule contents. Data from whole-cell extracts of murine CTL and resting T cells (illustrated in the same figure) indicate gross elevation of calreticulin in the CTL that cannot be estimated due to the presence of calreticulin from the ER. To elucidate the function of calreticulin within the granules, we added purified calreticulin to enriched perforin and monitored lytic activity. Calreticulin, at a concentration of 2.2 × 10−7 M, completely blocked perforin-mediated lysis (Fig. 1⇓). Lower calreticulin concentrations had less effect and followed a dose response in a 4-fold concentration range (Fig. 1⇓). Calreticulin inhibition of perforin-mediated lysis is dose dependent. Calreticulin 0.55 × 10 −7 M (♦), 1.1 × 10−7 M (▴), and 2.2 × 10−7 M (▾) reduced lysis of erythrocytes after 20 min of incubation. The circles indicate the control which lacked exogenous calreticulin. The assay was done with two-step enriched perforin (after IMAC). Bars indicate the SDs from the mean in this and subsequent figures. We have shown that calreticulin will block perforin-mediated lysis in 20-min assays (Table I⇑ and Fig. 1⇑). We wanted to know if the inhibition was transitory or would last over prolonged periods of time as lytic activity continued to progress. Indeed, lysis by phenyl Superose-purified perforin was inhibited by 5.5 × 10−8 M calreticulin, and the inhibition held over 5 h (Fig. 2⇓). 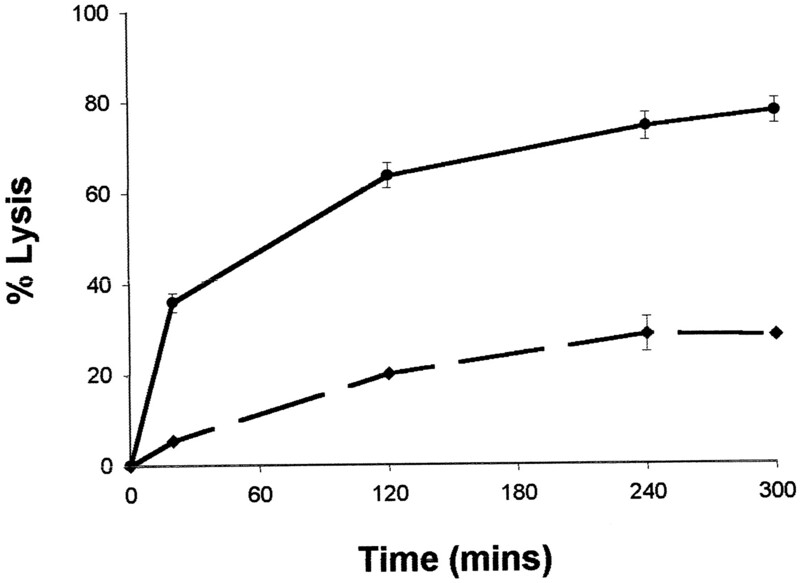 Control lysis increased during the first 3 h of the 5-h experiment. These experiments were repeated with crude granule extracts and the same (5.5 × 10−8 M) calreticulin concentration. The results indicated similar, long-lasting inhibition of lysis (not illustrated). These experiments show that early perforin-dependent lysis is significantly inhibited in the presence of calreticulin and that most of this inhibition holds throughout the lytic event. Inhibition of perforin-mediated lysis holds over time. Perforin lysis was inhibited by 5.5 × 10−8 M calreticulin (♦). 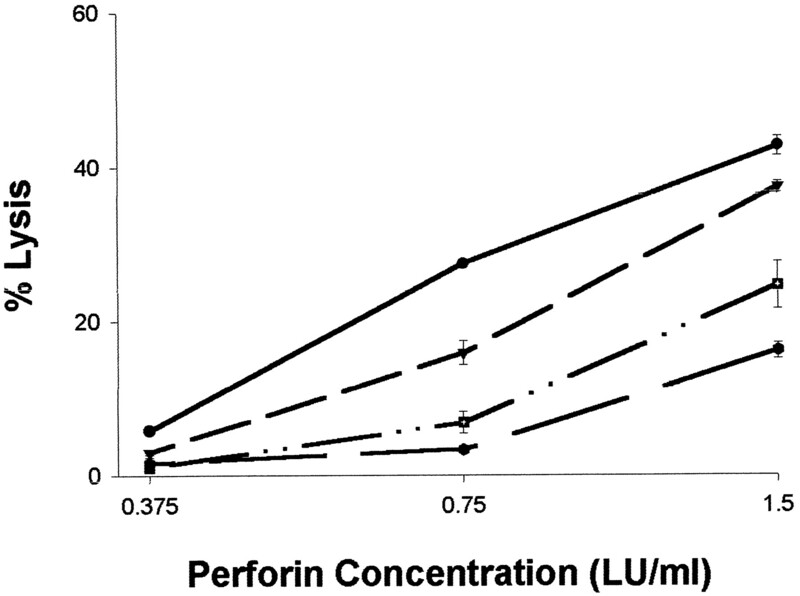 The inhibition of perforin lysis held for 5 h. The perforin was isolated by the three steps shown in Table I⇑. Where bars are absent, the SDs from the mean were <0.5%. To verify that the inhibition of perforin lytic activity was caused by calreticulin and not a copurifying, contaminating (ER) protein in the native calreticulin preparations, we repeated our experiments using recombinant calreticulin. Recombinant calreticulin could completely inhibit perforin-mediated lysis (not illustrated). However, the calreticulin concentrations required to achieve inhibition were significantly (∼8-fold) higher. To achieve 50% inhibition of the highest perforin concentration, 8.8 × 10−7 M recombinant calreticulin was required (Fig. 3⇓). Recombinant calreticulin inhibits perforin-mediated lysis. Recombinant calreticulin 2.2 × 10−7 M (▾), 4.4 × 10−7 M (▪), and 8.8 × 10−7 M (⬢) reduced perforin-mediated lysis (indicated by the •). The assay was done with two-step enriched perforin, incubated for 20 min. The calreticulin protein can be divided into three distinct domains based on structural analysis (Fig. 4⇓A and Ref. 33). To determine where within the calreticulin protein the perforin lytic inhibition activity was localized, we used fusion proteins containing the calreticulin domains. The three calreticulin domains were expressed as GST (Fig. 4⇓B) fusion proteins. The N-domain is the most highly conserved domain among the calreticulins of different species and binds proteins containing the KxFF[K/R]R motif. The P-domain, so named because it is proline rich, contains the high-affinity calcium-binding domain. The C-domain binds calcium with high capacity and low affinity. Each domain was evaluated for its ability to inhibit perforin-mediated lysis. The N-domain and the P-domain proteins, 9.1 × 10−7 and 1.1 × 10−6 M, respectively, had no inhibitory effect on perforin-mediated lysis (Fig. 4⇓B). The C-domain, at 1.2 × 10−6 M, inhibited perforin-mediated lysis by 50%. We conclude that the functional inhibitory domain of calreticulin is the C-domain. The efficacy of the C-domain was assessed through dose titration (Fig. 5⇓). The molar activity of the recombinant C-domain is comparable to the activity of the native calreticulin (Fig. 1⇑). These experiments indicate that the inhibitory domain of calreticulin is the C-domain. The calreticulin C-domain is inhibitory to perforin-mediated lysis. A, A schematic representing the three calreticulin domains. B, Inhibition of lysis. The three calreticulin domains (N, P, C) were evaluated for their ability to inhibit perforin-mediated lysis. 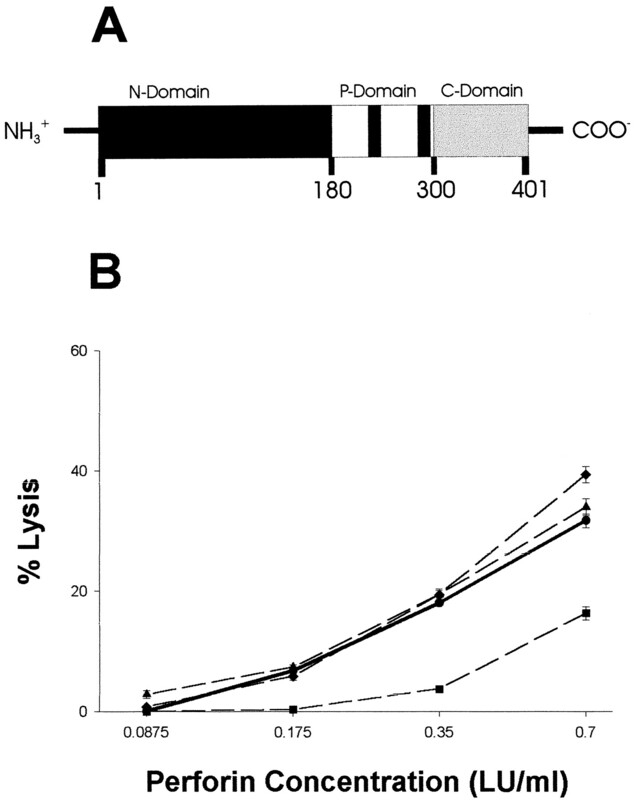 The N-domain (▴) and P-domain (♦) had no effect on lysis. The C-domain (▪) inhibited lysis. The • indicate the control in which no exogenous calreticulin was added. The experiment was done with two-step enriched perforin for 20 min. Calreticulin C-domain inhibition of perforin-mediated lysis is dose dependent. The C-domain fragment of calreticulin at concentrations of 3 × 10−7 M (♦), 6 × 10−7 M (▴), and 12 × 10−7 M (▪) inhibited perforin-mediated lysis. The assay was done with two-step purified perforin for 20 min. First, inactivation of granzymes (chymase or tryptase) will reduce perforin-mediated lysis (34). As a chaperone protein, calreticulin could affect either granzymes or their substrates. Second, calreticulin could inhibit perforin-mediated lysis through calcium sequestration. Although calreticulin interacts with perforin (5), it is conceivable that calreticulin my also inhibit perforin-mediated lysis by inactivating a granzyme, such as the recently purified chymase (12). To determine whether calreticulin was inhibiting perforin-mediated lysis through granzyme inhibition, we examined recombinant calreticulin’s ability to modulate three separate granzyme activities. First, 1 μM recombinant calreticulin was added to granzyme assays in which chymase, granzyme A and K (BLT-ase), and granzyme B (Asp-ase) activities were measured. In these experiments, there was no detectable modulation of enzyme activities when compared with buffer controls. The control granzyme activities were 5–20 mOD/min, making 20% or greater inhibition of granzyme activity detectable. Each mole of calreticulin can bind 25–30 mol of calcium, and limiting calcium concentrations can restrict perforin-mediated lysis. However, at the1-mM level of total calcium of the lytic assays, submicromolar calreticulin cannot bind enough calcium to lower the free calcium below the 100 μM calcium needed for hemolysis. If each calreticulin molecule were saturated with 30 molecules of calcium, at 0.2 μM calreticulin (which blocks lysis, Fig. 1⇑), ∼0.99 mM free calcium would still remain in the assay buffer (35). These calculations indicate calreticulin does not inhibit perforin-mediated lysis through calcium sequestration. To determine whether calreticulin was inhibiting perforin-mediated lysis through the presentation of a calcium-rich interface (to compete with phospholipid-bound calcium for perforin) or presentation of similar stretches of acidic amino acid residues, we evaluated the effects of calsequestrin on perforin-mediated lysis. Calsequestrin is a 44-kDa protein that is similar to calreticulin and binds 40–45 mol of calcium per mole of protein. Calsequestrin is a muscle-specific calcium-binding protein, and it is not found in cytotoxic granules. At 2.5 μM, calsequestrin had no affect on perforin-mediated lysis. It appears that inhibition of perforin-mediated lysis is dependent upon specific features of the calreticulin protein and is not a result of calreticulin’s calcium-binding properties. In this report, we show calreticulin, an endogenous cytotoxic granule protein, inhibits perforin-mediated lysis. This inhibition is dose dependent and persists over time. Through the use of recombinant calreticulin we have shown that the inhibition is attributable to calreticulin and not a copurifying protein found in the ER. The C-domain contains the inhibitory activity. Calsequestrin was unable to inhibit perforin-mediated lysis, indicating that the calreticulin inhibition is more than a calcium-binding phenomenon. Our results indicate calreticulin has a novel role in cytotoxic granules and participates in the regulation of perforin-mediated lysis. In this series of experiments, we used a lytic system composed of cytotoxic granules and erythrocytes. We chose a hemolytic assay because erythrocytes are lysed 30-fold more readily than nucleated cells (29) and because, so far, purified perforin has been impossible to obtain in large quantities. During purification, perforin loses >90% of its activity (24, 29, 36, 37). The hemolytic system should be viewed as a membrane model without direct correlation to physiological events because T and NK cells probably do not attack infected RBC. Thus the membrane in this model could just as easily represent the T or NK cell membranes as the membranes of their targets. Calreticulin consistently inhibited lysis by purified perforin, whereas it inconsistently inhibited unfractionated granule-mediated lysis. We lack a ready explanation for this observation. The current lack of quantitative assays for perforin (in any species) contributes to this dilemma and makes molar ratios of calreticulin to perforin currently undefinable. As a protein chaperone, calreticulin may be able to bind to several granule proteins as well as to specific calcium-dependent binding sites on RBC membranes. Complex competitive conditions are extremely likely after granule exocytosis. Also, different granule proteins are independently regulated, e.g., perforin (38) vs granzymes (39). Thus, the consistent effects of calreticulin on purified perforin may be variably impacted by other proteins in unfractionated granules. Calreticulin is rapidly digested by granzymes, which are depleted during perforin purification. We are currently isolating and characterizing these granzymes (R. Karimi and V. Elliott, unpublished data) and hypothesize that they physiologically counteract the effects of calreticulin. Native calreticulin was ∼8-fold more effective at inhibiting perforin-mediated lysis than recombinant calreticulin. This difference is most likely due to the fact that native ER calreticulin is nonglycosylated, while the recombinant calreticulin is made in yeast, where it is glycosylated (M. Michalak unpublished data). The calreticulin glycosylation residue, amino acid 326 (16), is within the inhibitory C-domain. Glycosylation of this residue could alter the inhibitory quality of the protein. It should be noted that the C-domain GST fusion protein that we found effective was nonglycosylated because it was produced in bacteria. We will now discuss how calreticulin might affect lysis and its potential site(s) of action. Granzyme inhibition has been shown to block the lytic process (34). It is possible that calreticulin could interact with a granzyme or granzyme substrate causing lytic inhibition. However, we have not been able to detect calreticulin inhibition of granzyme activities. We have also determined that the calcium-binding capacity of calreticulin is insufficient to make calcium a limiting factor in perforin lysis. We favor a membrane site for calreticulin’s effect on lysis for two reasons. First, calreticulin and perforin fail to interact in the presence of calcium (5) (even though the N- and P-domains can interact with perforin in the absence of calcium). Second, calreticulin binds to erythrocytes membranes where lysis occurs (35). Thus calreticulin could affect membranes without directly interacting with perforin. The effects of calreticulin in thrombosis are relevant because calreticulin blocked coagulation without direct interaction with the coagulation proteins. Calreticulin bound to the membranes of endothelial cells (Kd 7.4 nM; Ref. 40) where thrombosis was initiated (as it also bound to erythrocyte membranes (Kd 0.27 μM; Ref. 35) where pore formation is initiated). The effects were anti-thrombotic without reducing the serine protease activity of factors VIIa, IXa, Xam and thrombin (40). We found no effects on granzymes. Also, the C-domain was the only domain that was inhibitory to both thrombosis and perforin-mediated lysis. We propose that calreticulin stabilizes membranes to restrict osmotic lysis. Erythrocyte membranes can be made stable to osmotic lysis after binding many chemicals and proteins, including benzydamine or deoxycholic acid (41) and GroEL (42). It is likely that calreticulin binds to an erythrocyte population in a Gaussian distribution. At a critical concentration of calreticulin per erythrocyte, the membrane lipids may become more ordered (Fig. 6⇓, step 1, where order is illustrated by a smooth membrane surface). The ordered membrane may: 1) inhibit perforin binding to the erythrocyte; or 2) force incomplete insertion of perforin into the membrane; or 3) inhibit aggregation of bound perforin; or 4) any combination therein. Perforin inserts into membranes (43). We postulate that it inserts only half way through the lipid bilayer, where high concentrations of calreticulin are bound and all the way through the bilayer where calreticulin is low or absent (step 2). Large pores will form as the transmembrane perforin polymerizes (step 3, control and low calreticulin) (44) to cause lysis. Poly- perforin pores are unable to assemble where the perforin is not transmembrane (step 3, high calreticulin). We suggest that the inhibition of lysis lasts over time because the hydrophobic, membrane-associated perforin does not recycle. Support for a key aspect of this model, the critical distinction between calreticulin-membrane vs calreticulin-perforin interactions, is complicated. Prebound calreticulin dissociates from RBC membranes rapidly due to its moderate (Kd = 2.7 × 10−7 M) affinity (35). Therefore, calreticulin cannot be maintained exclusively at the membrane, which is a condition needed to eliminate potential effects of interaction of fluid-phase calreticulin with perforin. Model for calreticulin stabilization of membranes. Step 1, Calreticulin (knobs) stabilizes membranes in immediate proximity of the calreticulin. Smooth surfaces indicate lipid order; wavy surfaces indicate the normal movement of lipids within the membrane. Step 2, Monomeric perforin (spearheads) crosses through the membrane bilayer in the areas of lipid disorder. In regions of higher lipid order, perforin associates only with the outer monolayer of lipids. Step 3, Over time, monomers of perforin aggregate. If they are transmembrane, the perforin will polymerize to form large open pores where hemoglobin tetramers (60 kDa) can diffuse out. In contrast, surface-associated perforin only aggregates. In vivo, it is equally likely that the granule calreticulin will bind to the killer cell membrane as to the target cell membrane. If the calreticulin selectively binds the killer cell membrane upon exocytosis, it may confer protection to the killer cell during lysis. In cytotoxic lymphocytes, calreticulin mRNA is up-regulated 10-fold upon T cell activation (45), and the protein transported into the induced cytotoxic granules (5) for exocytosis during lysis (46). Calreticulin can bind perforin (5) and target cell membranes (35). Our contribution to the growing bodies of knowledge about both cytolysis and calreticulin is that calreticulin can regulate lytic function. Experiments are in progress with calreticulin gene-ablated (47) lymphocytes to further elucidate the role of calreticulin in cytotoxic function. We gratefully acknowledge helpful discussions with Drs. William H. Welch, Gretchen E. Koot, and Leanne Vollger (University of Nevada, Reno). The superb technical assistance of M. Dabrowska, in the laboratory of M. Michalak, is greatly appreciated. ↵1 This research was made possible by grants from the National Institutes of Health (R01 CA38942 to D.H. and T32 CA09563 to S.A.F.) and from the Medical Research Council of Canada (to M.M.). M.M. is a Medical Research Council Senior Scientist and an Alberta Heritage Foundation for Medical Research Medical Scientist. ↵3 Abbreviations used in this paper: ER, endoplasmic reticulum; IMAC, immobilized copper metal affinity chromatography; HIC, hydrophobic interaction chromatography. Henkart, P. A., M. S. Williams, H. Nakajima. 1995. Degranulating cytotoxic lymphocytes inflict multiple damage pathways on target cells. G. M. Griffiths, and J. Tschopp, eds. Pathways for Cytolysis 75 Springer-Verlag, Berlin. Michalak, M.. 1996. Calreticulin R.D. Landes, Austin, TX. Bleackley, R. C., E. A. Atkinson, K. Burns, M. Michalak. 1995. Calreticulin: a granule-protein by default or design?. G. M. Griffiths, and J. Tschopp, eds. Pathways for Cytolysis 145 Springer-Verlag, Berlin.